Are you passionate about Parmesan, enthusiastic about Edam and crazy for Camembert? With a Pong Cheese discount code you can get great deals on some of the world's most delicious cheeses – all delivered straight to your door. So whether you're a dedicated cheese-lover looking for something unusual to treat your palette or an amateur looking for an introduction to artisan cheese, a Pong Cheese discount code will help you satisfy your cravings for less. Pong Cheese was established by two friends from Bath – the capital of Somerset, which is regarded as the homeland of British cheese. Combining their backgrounds in internet marketing and high-end cheese catering, the founders set up Pong Cheese to raise the profile of cheese in the UK. Feeling that the traditional after-meal cheeseboard had been overlooked for too many years, they sought to create an online marketplace where some of the best artisanal cheeses from around the UK and Europe could be found – and delivered straight to your door. Pong Cheese focuses on unique and individual cheeses, hand crafted by independent producers to the very highest standards. As well as a range of hard, soft and blue cheese from the UK, there are some classics from Europe available to purchase. So you'll find lesser-known cheeses like Berkswell and Flower Marie rubbing shoulders with famous English favourites like cave-aged Cheddar and Cropwell Bishop Stilton – not to mention delights from the continent like Roquefort and Manchego. At Pong Cheese's comprehensive online shop, cheese lovers can browse hundreds of cheeses by category or country of origin to build up their own dream cheese board, or choose a pre-selected combination from the Monthly Cheese Boxes section. Each cheese on the website is accompanied by a detailed description telling customers where and how it was made – you'll even find tips on how best to serve the cheese and any recipes it works well in. In addition to individual cheese, the website offers a selection of cheese gift boxes, chutneys and condiments, biscuits for cheese, books about cheese, cheese boards and accessories and more. The 'Big Cheese' blog features cheese insight and tips from the experts behind the company, while the recipe section ensures you'll never run out of ways to serve your favourite cheese. Want to get shopping with Pong Cheese? With a Pong Cheese discount code you can enjoy fantastic savings on as much Gouda, Brie or goat's cheese as you can handle. So whether you want to compile a cheese board to impress for a big party or simply to enjoy a monthly treat of fine, artisan cheese, a Pong Cheese discount code will help you get more for your money. Browse our website until you find a Pong Cheese discount code that suits you, then navigate to their website to begin shopping. Enter your Pong Cheese discount code in the box provided and click 'Apply'. If you've enjoyed shopping for delicious cheeses with Pong Cheese, you might like to check out more great deals on foodie treats at Tesco or Ocado. Or, if those aren't right for you, you'll find plenty more stores to browse in our Food and Drink section. Fill in your delivery details and click 'Continue'. Standard UK delivery is free on all orders over £50. On orders under £50, a delivery charge of £4.95 applies. Need to contact the team at Pong Cheese? Whether you have a question about your order, want to know more about the making of artisan cheeses or simply want to find out how you could make big savings with a Pong Cheese discount code, you can contact the helpful Customer Services department by calling 08447 453065. Want to explore the world of artisan cheeses with Pong Cheese? The company maintains a profile across all the major social media networks. Follow them for lots of exclusive content including cheesy recipes ideas, competitions, cheese facts and much more. You can also use these pages to find out more about saving money with a Pong Cheese discount code. Don’t forget to check them regularly, as you can never be sure when a free Pong Cheese discount code might be waiting for you! Buy now online at www.pongcheese.co.uk/. My sister-in-law absolutely adores cheese, so last Christmas I used a Pong Cheese discount code to get her a fantastic present. 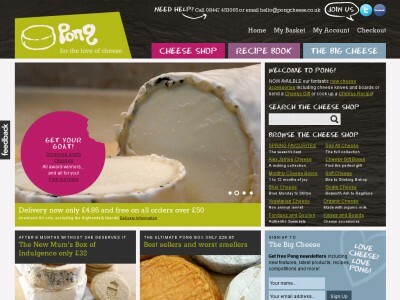 At pongcheese.co.uk they stock a huge variety of cheeses and gifts for cheese-lovers – all available at a discount with a Pong Cheese discount code. I used my Pong Cheese discount code to get a great deal on a monthly cheese selection pack – so she can enjoy delicious artisan cheese delivered to her door every month. Love cheese or know someone who does? See what you could save with a Pong Cheese discount code.